1. Beat yolks of eggs with buttermilk. 2. Mix together sugar, salt, flour, baking powder, baking soda, and cardamom. 4. Mix egg yolk-buttermilk mixture with dry ingredients. 5. Add egg whites, carefully folding them in so that they don't break down. 7. Put 1 tsp salad oil in each hole and fill completely with batter. 8. Let bake until slightly crusty on bottom. 9. Turn slightly with a knitting needle or skewer. 10. Continue cooking, turning the ball to keep it from burning, until the knitting needle comes out clean when stuck in the center. 11. Serve aebleskive hot with powdered sugar, jam, and jelly. 12. 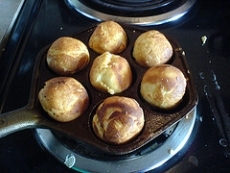 Notes included with recipe: For those of you who are unfamiliar with aebleskive, it is a baked delight made with a pancake-like batter, cooked in a special pan that turns the aebleskive into a crusty ball, and is known as the "Danish Doughnut." As you can tell, it is a little difficult to give aebleskive an easy definition other than to tell you that it is good enough to go ahead and order the pans if you are likely to serve breakfasts and brunches to family and friends.